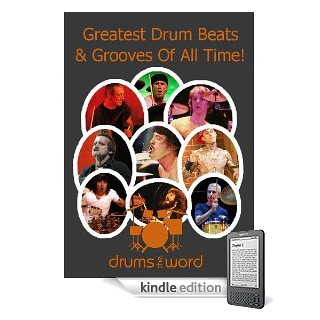 Greatest Drum Beats Book Now Available On Amazon Kindle! I’m excited to announce that you can now purchase my book “Greatest Drum Beats & Grooves Of All Time” from Amazon Kindle for use on any Amazon Kindle eBook Reader. The Kindle version of my book is exactly the same as the version you can download form my website except that it runs specifically on the Amazon Kindle eBook reader only. The Kindle version of the book obviously doesn’t come with any of the Video/DVD Demonstrations but can be instantly downloaded form either the UK or the US Amazon Websites. You can view the book on the website HERE. Learn how to play over 240 of the Greatest Drum Beats & Drum Grooves Ever Performed with this HUGE 168 page Book. Learn how to drum just like the Drumming Masters by learning THEIR Drum Beats & Grooves, Note for Note! Every single Drum Beat is Broken Down and Explained in Great Detail. Playing Tips and practical Advice are given to Help You Play these Drum Beats Quickly and Easily. This Extensive Drumming Resource takes you by the hand and guides you Step By Step through 130 Classic Songs (the MAJORITY of these songs feature Multiple Drum Beats), performed by over 80 Legendary Drummers. Over 240 Great Drum Beats, Licks & Grooves FULLY transcribed and explained. Each Drum Beat is Broken Down and Explained in Great Detail. Advice and Practice Tips offered.